In a city of walls and secrets, where only one man is supposed to possess magic, seventeen-year-old Kai struggles to keep hidden her own secret—she can manipulate the threads of time. When Kai was eight, she was found by Reev on the riverbank, and her “brother” has taken care of her ever since. Kai doesn't know where her ability comes from—or where she came from. All that matters is that she and Reev stay together, and maybe one day move out of the freight container they call home, away from the metal walls of the Labyrinth. Kai’s only friend is Avan, the shopkeeper’s son with the scandalous reputation that both frightens and intrigues her. Gates of Thread and Stone was easily one of my most-anticipated new releases this year. The idea that the main character could manipulate the threads of time held all kinds of promise and the story itself really came off sounding like nothing I'd come across before. Unfortunately, from the first pages I had some concerns about the world-building (or lack thereof) and as the story progressed, as much as I wanted to ignore the other issues that I came across and focus on the good stuff, it became impossible. Still, I held out hope that the ending would bring everything together and wow me...but man, that ending just muddled things up even more and I was left feeling largely let down. Gates of Thread and Stone starts off by introducing us to Kai, the protagonist in her day-to-day life. She lives with her adoptive brother Reev in a building structure known is The Labyrinth. It's a sort of a maze of storage units where the poor people of the city live. Kai and Reev have been together since Reev rescued Kai abandoned by a river when she was around 7 years old. She has no memories of her life before then or of any possible family outside of Reev so she and Reev have always stuck together. It's better to have someone in a city like this, which is ruled by an oppressive and lethal tyrant, Nimu. Nimu is the only being supposed to have any sort of magical abilities...except that that's not quite true. Ever since Kai can remember, she's had the ability to manipulate the threads of time. A power she must keep secret if she wants to survive. Soon though, her quiet existence is threatened when Reev suddenly goes missing and Kai is willing to sacrifice it all to find him again. So she sets off with the help of her friend Avan, a cute shopkeeper from her neighborhood. In the world of Gates of Thread and Stone, you're only safe within the walls of the city. Apparently the rest of the world was devastated by some cataclysmic event hundreds of years ago and outside the walls is this massive forest and then further out, something known as 'The Void' which is more or less a vast wasteland. There might be more people elsewhere in the world, but the people of the city don't know, nor do they seem to want to know. So when Kai and Avan have searched the city to no avail, they learn that Reev might have been taken by a mythical Dark Rider who legend has it lives within The Void, they venture out beyond the walls to find him. There was this big build up to them leaving the safety of the walls surrounding the city... and by 'big' I don't mean lengthy, I mean it was clear that this was a BIG deal. So, I was expecting vivid imagery and lots of details of this wild new world. The problem is, none of it was ever fully fleshed out. We never get more than a few paragraphs on what actually caused all the devastation, which made it hard to get a sense of what the characters were dealing with here. Then they set out and within a few sentences of them having left the city, they're already at this supposed vast forest. Again, we get next to no details about their surroundings and in a matter of seconds, they've already crossed this 'massive' forest and have made it to 'The Void'. Here the only thing we learn is that it's foggy and apparently they need to 'become lost in order to find what they're looking for'. And then, BAM: they find themselves right where they need to be! All these events should have taken up like a huge chunk of the book but it all happened ridiculously fast. There was virtually no world-building and that is a pretty big issue for me. I mean, I don't need epic-fantasy level world-building in YA novels... but I do need some. When we do get details on the world, they were usually info-dumps that seemed to randomly be thrown into the MC's current train of thought. As for the plot of Gates of Thread and Stone, well there was a lot of promising elements but none were properly utilized. There was the quest aspect to rescue Reev. Once they find out where he is, they need to organize a sort of rescue mission, which involved Kai and Avan getting self defence training - which was kind of cool. The mystery of Kai's powers was another promising aspect. Her actual abilities were fascinating but since no one is supposed to have magic, she has to keep it secret as much as possible. I was curious to find out why she had powers in the first place, given that no one but the ruler is supposed to have magic. The rescue mission and all the mysteries finally come to a head at the end, but instead of meshing together and become one giant, epic finale, it all ended up not fitting together the way it ought to. Then there was one twist thrown in after another which frankly, made the believability factor go way down, even for a fantasy read. If the ending had wowed me, I think it could have saved the book but instead it had the opposite effect. The characters themselves were likeable enough. Kai was brave but stubborn. Her devotion to her 'brother' should have won her some points but to be honest, at times it felt a tad obsessive. I mean I get that she has no one else, but it made her oblivious to everything and everyone else around her. Including Avan. Avan was likeable enough in his own but I never was able to shake how random it was that he tagged along with Kai given the state of their relationship at the start. That bit does get explained at the end but it still felt a little too convenient. There's something of a romance too that develops as well, but with Kai so focused on Reev, she apparently couldn't see the signs of this guy's feelings for her. I can't reveal much else about any other characters since their...nature could make any talk of them kind of spoilery. Needless to say, it's another aspect that felt haphazardly thrown in to an already eclectic mix. 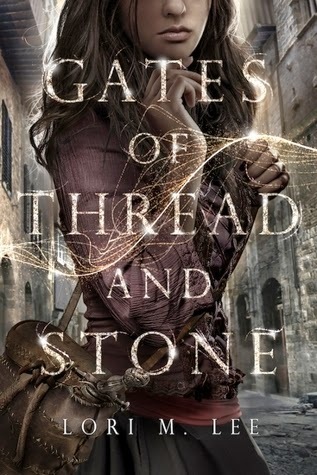 I had such high hopes for Gates of Thread and Stone, and while it did hold some promise with the heroine's ability to manipulate the threads of time, a potential quest and a romance, but the bottom line is it never fully settled into a nice flow with a believable progression of events. That, combined with a lack of proper world-building and character development made this one a pretty big letdown. I wish the ending had turned things around but sadly this story was not to be saved. This is the second review I've read of this book and the other person wasn't really a fan either. It's a shame because it sounds like such a great premise (and I love the cover!). But the complete lack of worldbuilding combined with a lack of cohesiveness in the plot makes this one sound like a dud. Better luck next time!! Well, it makes me feel a bit better to know that I'm not the only one who had a rough time with this one. It really IS a shame, it had so much potential but the lack of proper worldbuilding and randomness of the plot just were too much to ignore. Thanks Nicole!! Yeah, it wasn't just the lack of world-building (which was like non-existent) but the different plot elements just didn't really mesh together :( I hope you have better luck with it though!! I'm sorry to hear that this disappointed you so much, the description of it sounded so good too. It just shows that world building and a well written story really make or break a book. I agree, it sounded so bloody good...maybe too good! It definitely did not live up to the expectations I had going in :( But yeah, worldbuilding is so, so important - even if it isn't extensive, it HAS to be there. Oh, what a bummer! :( This sounds disappointing all-around, especially with the murky world-building and info dumps, both of which drive me crazy, too. Sorry this one didn't work out, Micheline; I don't think it would be my cup of tea, either! Sorry to hear you didn't enjoy this! I noted in my review that I was uncertain on calling it a dystopian or a sci-fi. It could go either way, due to the stretchy background. Are you going to continue the series? Yeah, I was, and still am seriously bummed out about this one. I wanted to love it so much!! I doubt I'll continue with the series...unless I see some major rave reviews for it that end up swaying me. Like I said on Twitter, I really appreciate this review since I was very taken in by the cover's prettiness. I definitely would not enjoy this one I think, so now I haven't wasted time and money on a pretty cover! I'm so sad to hear this one didn't work for you :( I only heard about it a month or two ago but I had high hopes based on the description and that beautiful cover. That less than stellar world building you mention though... big thumbs-down for me. I take most of my reading pleasure from world building. And the whole progress through the forest and void without proper description - why?? This reminds me of my experience when I read Chantress. It promised so much world building but it was never experienced by the main character (she is mostly just inside different buildings, confined) and just basically info-dumped on her and the reader during many long, monologue-ish conversations.